On average a women may gain 5 – 7 kilos per decade as they get older. There are a few theories as to why and most relate to hormonal imbalances and physiological changes that occur as we age. Waist measurement is however the best guide to health and unfortunately usually where we store fat as we approach the menopause. For women, 80 cms and under is the ideal for health. When you start to go over 80 cms, it can increase the likelihood of conditions such as diabetes and heart disease. Wise Women tip: Ditch the scales & start measuring your waist! Some women put on weight at this time simply because they are eating or drinking more than their body needs. While I am not a big fan of counting calories, counting nutrients is more important. We still need to know roughly how much we are consuming. This gives calorie counting a context. If you eat a lot of food that is not prepared by you, you are guessing. Doesn’t matter how healthy it looks. If doesn’t have a label or you didn’t make it you don’t know what’s in it. Start keeping a food diary and be aware of the calories you are eating particularly if you are eating for energy. We become more sensitive to starch, so it also worth checking what the ratio on your dinner plate are. Ideally meat and two veg! Hormones estrogen & progesterone are not produced in the same quantities as you approach the menopause. The average age of the menopause is 51, but you may feel the effects of declining hormones up to five years beforehand. There are a different set of symptoms associated with each declining hormone. Additionally these two hormones work together so if they do not fall at the same rate that creates another imbalance in the body! Estrogen is stored in our fat cells, so your body may be trying to store more fat if you are producing less estrogen from your ovaries. This would help lessen the effects that lowering estrogen levels have on the body, but usually means you are a bit heavier around the tum than you would like to be. The hormone Progestorone helps to keep your waist trim. When it starts to lower it can cause your waist line to expand. Your body can make progestorone from your adrenal glands, however if you have a stressful life the adrenals will prioritise creating stress hormones over creating progesterone. You may find you have had an increase in PMS symptoms which may include an increase in cravings. Comfort foods or drinks can be a habit forming. It is worthwhile to monitor why you are eating, is it craving or habit after the craving? If you struggle with cravings old fashioned cocoa works a treat. There is a lot research that it helps cravings and also helps with memory. Lifestyle changes may mean you are less active. Muscle mass will naturally decrease as you get older. Which results in a lower metabolism, which means you need less calories. However this is reversible if you do any sort of resistance training which builds muscle and has the added benefit of strengthening bones as well. Most of us will think about increasing cardio exercise to reduce our waistlines so more running, spinning or aerobics. It might surprise you to know this is not the most effective way to change your shape or your waist. Restorative exercises such as walking and Yoga are good ways to reduce stress. Resistance training causes an increase in the hormone testosterone. It keeps fat off your middle at menopause, so we like this hormone! This is definitely an exercise for you to consider, even if you hate gyms there are other options! If you are thinking of exercising, always check with your doctor first. Then ask an expert for help! You might already be a member of a gym, the instructors will be delighted to help you and design a new programme for you. Your husband may have a mini gym in the garage and will be able to help you get started. Good form is really important so start off with the basics and have someone monitor you if you can. 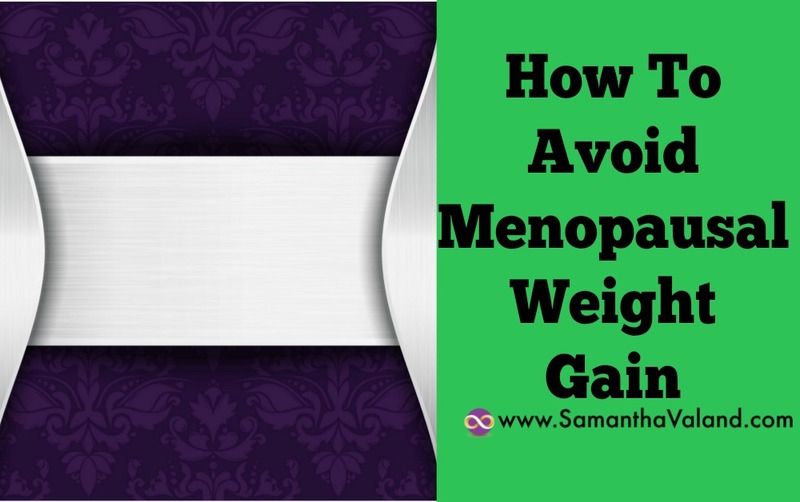 To avoid menopausal weight gain you have to treat it differently to weight gain in your 20s. Keep a food diary – Paying attention to why and how you are eating is as important to what you are eating. The important thing to keep top of mind is that you have more control than you realise by the way your live your life. The type of food you eat, by moving more and exercising effectively and me time.